Celebrating 47 years in business. Our customers say that we have the best catalog in the business. 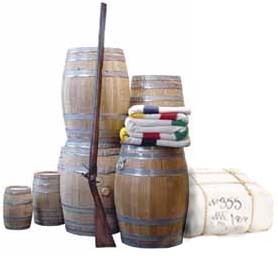 We Specialize in Muzzle loading guns, kits, parts, accoutrements, rendezvous gear & primitive Americana. Click here to view a printable map with directions. Elk River, Minnesota is located about 35 miles north and west of Minneapolis. Track of the Wolf, Inc. is located on the west edge of Elk River. Take Highway 10, westbound, through Elk River to the Joplin Street stoplight. This intersection is clearly marked, at the far west edge of town. Turn south on Joplin Street NW, one block, to 18308 Joplin Street NW. Notice our two new identical tan and brown stone block buildings. Enter the south door of the south building, furthest entrance from Highway 10. 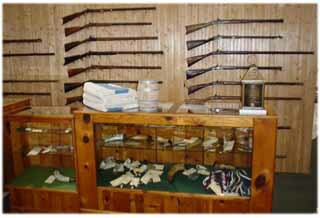 We have a small display area, showing dozens of our one-of-a-kind muzzle loading guns for sale,ammunition, and cleaning supplies. Our retail area is open Tuesday to Friday from 1 PM to 5 PM. Weekday mornings, and Mondays are reserved for mail and internet order fulfillment. Our retail area is closed on Saturday, Sunday, Monday, and Holidays. Mail order merchandise is not on open display in our store, but we can fill your order from our large inventory, within 30 to 60 minutes. 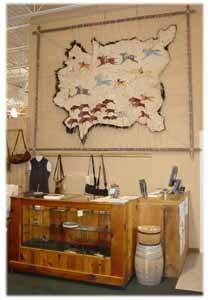 When visiting our store, allow 30 to 60 minutes to view our displays, and fill your order. We install our breech plugs, sights, underlugs, ribs, and ramrod pipes in the new muzzle loading gun barrels we sell. Prompt service within 7 to 14 days. We service muzzle loading guns, and antique black powder cartridge guns, only. We do not repair modern firearms. You may deliver items for gunsmithing to our store. No work is done on-site. Shop time typically requires 7 to 14 days for most jobs. When complete, your items are returned directly to you, from our gunsmith's shop. We can provide spare parts and service for the items we sell, and most American made locks and gun parts. We have very few parts for Italian and Spanish made muzzle loading guns. Inquire before you send any imported gun or lock for repair. Telephone orders: 763-633-2500. Call 9 AM to 5 PM weekdays. If all lines are busy, or no answer, keep trying. No machines will answer our telephones during business hours. Facsimile orders: 763-633-2550. Fax anytime, day or night, 365 days per year. Fax orders are very convenient. Store hours: 1 PM to 5 PM Tuesday to Friday. We reserve morning hours and Monday to serve our mail and internet order customers. We have only a small merchandise display area. Most items are not on open display. Allow 15 to 30 minutes to view our small in-store merchandise display, when touring Minnesota. Dial 763-633-2550, anytime, day or night. Late night faxes cost only a few pennies to send, less than a letter. Fax orders arrive instantly, in writing, for same day shipment. Fax orders are secure, since card numbers are sent as images. Many computer modems can be configured to send fax orders. Fax machines handshake to insure correct transmission and printing. We do not acknowledge fax orders, since they are so reliable. Call 763-633-2500. Talk to our knowledgeable staff. We will take your order, check stock on hand, quote our best prices, answer technical questions, confirm that your choice of parts will work well together, or suggest alternate parts for better fit, lower cost, or faster delivery. Tell us your plans, and ask for our suggestions.